D & E REALTY CO., INC. vs. FRANK FODERA, Trustee of Everett Commerical Realty Trust. DECISION and ORDER; D & E REALTY CO., INC'S MOTION FOR SUMMARY JUDGMENT. MISC 131762 : FRANK FODERA, Trustee of Everett Commercial Realty Trust vs. D & E REALTY CO., INC. and GENERAL ELECTRIC COMPANY. The Plaintiff, D & E Realty Co., Inc. ("D & E"), originally brought this matter in the Superior Court seeking a declaratory judgment as to the rights of the Defendant, Frank Fodera, Trustee ("Fodera"), in and to a certain forty (40) foot wide easement running northerly along the easterly boundary of Lots 3 and 4, between Norman Street and Lot F, in Everett, all as shown on Land Court Plan No. 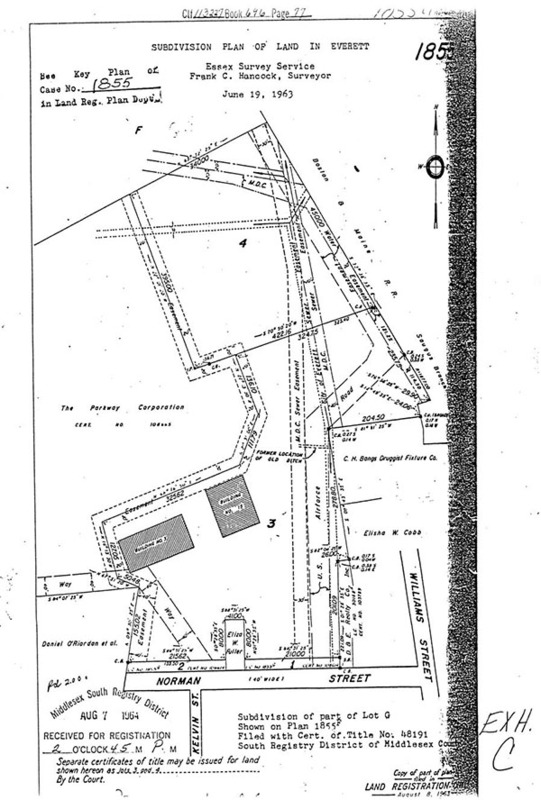 1855H ("H Plan"); a copy of which is attached hereto, said easement appearing as "Airforce Road" thereon. D & E also asks the Court to enjoin Fodera from further use of the easement. Sometime thereafter, Fodera filed a complaint seeking similar declaratory relief in this Court and asked that the Superior Court case be transferred here. Both cases were heard on April 5, 1989 on D & E's motion for summary judgment. At present, D & E is the owner of Lot 4, Fodera is the owner of Lot 3 and General Electric Company ("G.E.") is the owner of Lot F. There is no dispute as to the rights of the parties in the easement along the westerly property lines. After hearing arguments of counsel; reviewing the lengthy and very complete affidavits and attached documents filed by both parties, along with all memoranda of law, I rule that there is no genuine issue of material fact and that therefore, the case is ripe for summary judgment pursuant to Rule 56, Mass. R. Civ. P.
1. In 1941, G.E. subdivided a large tract of registered land into Lots F and G, as shown on Land Court Plan No. 1855F ("F Plan").
. . . for the purposes of constructing, maintaining and using in common with the grantor, a roadway forty (40) feet wide . . . .
Said easement provided access between Lot F and Norman Street, a public way. 3. In July of 1962, the United States of America ("United States"), having acquired title to Lot F, released to G.E. all rights in the forty foot wide roadway easement "for the purpose of making a non-substantive change in the grant of easement description, Docmnent No. 381909." 4. By the document registered immediately thereafter, Document No. 381910, G.E. granted to the United States and its assigns a forty foot wide easement following the location of the former easement, more or less, but omitting the language "in common with the grantor". The grantee acknowledges this as being a similar roadway easement to that previously released. The release noted in paragraph 3 above was conditional upon the United States receiving a "similar roadway easement". This easement is designated "Airforce Road" on the H Plan. 5. On July 31, 1962, G.E. 's assign conveyed Lot G to the Parkway Corporation ("Parkway") (see Certificate No. 108665) which subdivided Lot G into Lots 3 and 4 and thereafter conveyed Lot 3 to D & E by Document No. 400531.
. . . 22. Rights and easements conveyed by General Electric Company to United States of America by . . .381910. . . .
. . . The Grantor herewith grants to the Grantee in common with the Grantor and its assigns, an easement along a forty (40') foot way as shown on the aforementioned plan [1855H], for ingress and egress for Norman Street to the land of Grantee and remaining land of Grantor. The Grantor reserves for itself and its assigns an easement in common with Grantee for ingress and egress from Norman Street to the land of Grantee and the remaining land of Grantor. The H Plan shows a forty (40) foot wide easement ("Airforce Road") traversing the easterly side of Lots 3 and 4 and an additional forty (40) foot wide easement following and, for the most part, straddling the westerly boundary of Lots 3 and 4. The parties agrees that both Lots 3 and 4 have a right to use the latter easement. There is appurtenant to the above described land an easement along the forty foot way shown on said plan in common with others entitled thereto, more particularly set forth in Document No. 400531. The above described land is subject to the reservator as its easement more particularly set forth in Document No. 400531. The Memoranda of Encumbrances on this Certificate lists the easement to the United States - Document No. 381910. From the foregoing language, it is clear that the deed and Certificate are referring to the two separate easements as shown on the H Plan. Lots 3 and 4 are granted rights in the westerly easement, but at this point have none in the easterly Airforce Road easement. 6. On December 22, 1967, Parkway conveyed Lot 4 to Anne R. Crosby ("Crosby"), Document No. 451353, Certificate No. 125798. 7. On December 2, 1968, the United States conveyed to Crosby, by Document No. 462494, all its right, title and interest in the Airforce Road easement. 8. In November 1973, Crosby conveyed Lot 4 to Kathleen I. Burns ("Burns"), Document No. 517469, Certificate No. 142574. There is no mention of the Airforce Road easement in this deed nor is there any on the Certificate. The deed states that the premises are to be subject to and with the benefit of rights and easement referred to in Certificate No. 125798, which in turn notes the Airforce Road easement - 381910. In any event, I find that the easement was solely for the benefit of and appurtenant to Lot F and as such could not be conveyed so as to give Lot 4 an easement over Lot 3. 9. In February 1974, Burns conveyed Lot 4 to Marlin Realty Trust ("Marlin") "subject to and with the benefit of the rights and easements . . . in Cert. 108665" - the Parkway Certificate. Marlin's Certificate No. 143328 makes no reference to Airforce Road or to Document No. 381910. At the time of the filing of the taking described below, Document No. 673539 ("Taking") was noted on the Burns Memoranda of Encumbrances. 10. On December 20, 1984, the United States filed a complaint and a Declaration of Taking ("Declaration") in the U.S. District Court, Document No. 673539. The Declaration states that the rights and easement taken are those originally created by Document No. 381910. It further describes the easement as non-exclusive and reserves to the subordinate land owners "all such rights and privileges as may be used without interfering with or abridging the rights and easement hereby acquired." Both Crosby and Marlin are designated as purported owners in the Taking. The language of the Taking permitted the owners of Lots 3 and 4 to use the easement as it existed on their land in any manner not inconsistent with the Taking. It did not, however, grant Lot 4 an easement over Lot 3. 11. On August 8, 1985, Marlin conveyed Lot 4 to Fodera, Document No. 687215. The deed appears to be subject to and with the benefit of all rights and easements set forth in Certificate No. 143328. As of the filing of the memoranda in this matter, no Certificate has issued to Fodera. The easement shall not limit the ability to the owner of Lot 3 . . . to pass and repass over the portion of said easement as crosses Lot 3 . . . The easement taken shall inure to the benefit of and shall be appurtenant to the owner of Lot F . . . Said easement may not be assigned to any other person . . . Nothing in this judgment shall empower the owner of Lot F to grant to the owner of Lot 4 . . . any right to pass and repass, install utilities or to do any other act over the portion of the easement taken crosses the land of Lot 3. . . . The Amended Judgment is not registered, but appears to have full effect and to be binding on the subject properties, as appropriate under the Supremacy Clause of the United States Constitution. 1. Since the registration of Document No. 381910 in July of 1962, the "Airforce Road" easement has been an easement exclusively for the benefit of Lot F.
2. The right of way referred to in Document No. 400531 (Deed of Parkway to D & E) is the forty (40) foot wide way located on the westerly side of Lots 3 and 4. The establishment of the right of way by Parkway at the time it subdivided Lot G into Lots 3 and 4 is consistent with Airforce Road being an exclusive easement for the benefit of Lot F.
3. The grant to Crosby of Airforce Road conveyed only that portion which crosses Lot 4, since by the nature of the easement the owner thereof could not grant its rights in the easement to the owner of Lot 4 so as to give such owner rights over Lot 3. 4. The December 20, 1984 taking left Lot 4 rights, in common with the United States, only in that portion of the easement which crosses Lot 4. By the wording of the taking, it clearly did not give Lot 4 rights over Lot 3. Any question as to this is resolved by the June 12, 1987 Amended Taking. In consideration of the foregoing, I rule that Lot 4 has no right appurtenant or otherwise to use that portion of Airforce Road located on Lot 3 as shown on Land Court Plan No. 1855H. Accordingly, I award summary judgment to D & E Realty Co., Inc. and order that Frank Fodera, as Trustee of Everett Commercial Realty Trust, his agents, servants, successors and assigns be and hereby are enjoined from entering upon, travelling across or passing over that portion of Airforce Road which is located on the land of D & E Realty Co., Inc.